This painting inspires me for the simple reason that I love the story of Archangel Michael. He’s one of the chief angels and is known as the leader of God’s army. He’s the ultimate triumph of good over evil; the defeater of Satan. 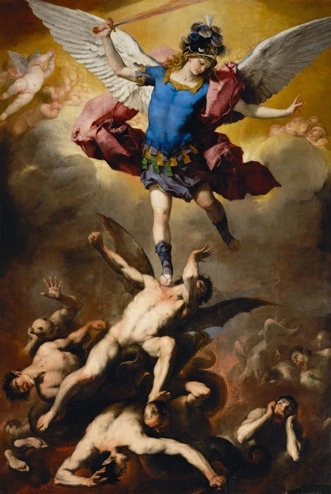 In artistic representations of Michael victorious over evil, satan is generally depicted as either a devil or as a dragon. In this picture here, 17th century Italian artist Luca Giordano paints satan with such human characteristics that the viewer might easily think Michael triumphs over an ordinary man. But a closer examination reveals the devil’s giant black wings behind him, almost like those of a bat. I like how Giordano puts Michael’s sandaled foot on the devil’s shoulder and you can see him and all evil tumbling downward, to hell. I was lucky enough to see the actual painting at the fine arts museum in Vienna and it’s amazing. It’s a really large painting and I was drawn in from the minute I spotted it. There’s nothing finer than the good guy finishing first (not last) and evil a**holes getting just what they deserve. Whoever said nice guys finish last never met Archangel Michael.